I’m no stranger to the desert. 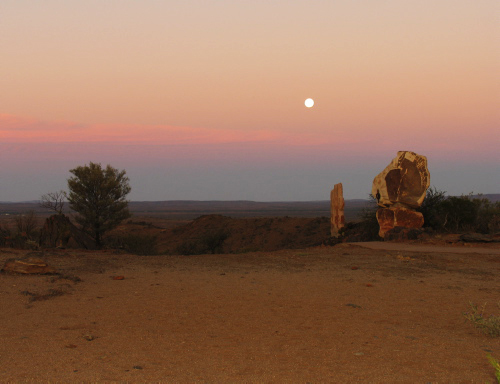 Although I grew up on the coast, in sub-tropical Sydney, and I now live in green and rainy England, I spent two wonderful years working in the Australian outback. Right out in the big dry red dirt country. I loved the desert there. The huge skies. The sense of space. Being able to walk for miles without seeing anyone else, feeling it was just me and God out there together. There was something so special about that place and that time. The land is dry, but it’s meant to be that way. The dryness feels right. Creatures and plants designed for the arid zones are adapted to drought, long periods with no rain. The desert is full of life. But when it comes to a spiritual desert and a faith drought, it’s a whole different thing. We’re not designed to go spiritually dry. That desert feels empty, lifeless, desolate. It’s hard to move through. It’s either soft slippery sand that slides away as we try to walk on it, or uneven and rocky underfoot. The simplest task becomes a struggle. In that dryness, everything fresh and green about us shrivels away. No one wants to feel themselves reduced to a bundle of dried out twigs, but that’s all that seems to be left of us. So not what we were created for. Yet almost all of us experience a dry season, at least once. A period where we seem to wander endlessly in the desert, thirsting for God, yet he feels so far away. So many things can put us in the desert. Anger with God over unfulfilled hopes or things that go wrong. Doubt that He keeps His promises, because His time frame is not ours. Unconfessed sin, keeping us from feeling His presence. Or maybe, like the Israelites wandering for forty years after leaving Egypt, God wants us to experience the desert. 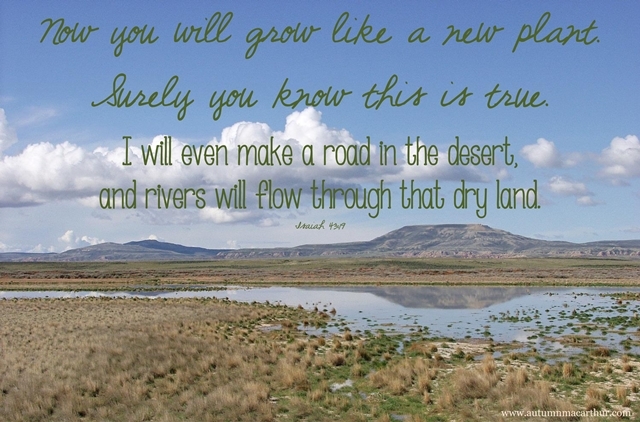 The dry spells can teach us so many lessons, and bring us closer to him. The desert separates us from our usual way of doing things. It forces us to look at our lives and do things in a new way. If we let it, the dryness can split open our hard shells, and allow God to reach new parts of us. He breaks us open, so He can build us new, in His image. He takes away all our usual supports and defences, so all we have left is Him. Some of you know, I’ve had a rocky start to the year. A flu that still lingers. The illness and death of a beloved pet. My husband’s ongoing health problems and complicated medical care. Financial concerns. A book that just doesn’t seem to want to get finished, that will be weeks late. And that of course is exactly what God wants me to do. Surrender to Him. Give Him true Lordship over my life. Stop struggling to be enough on my own, and let Him be enough, let Him be everything. That’s the true purpose of the desert. To strip us of all that is not in the image of God. To take us to a place where we have to drop the insistence on trying to struggle through under our own power, and learn what it means to truly rely on Him. My word for the year is “enough”. I didn’t expect it would mean me holding my hands up in surrender saying “enough” to the struggle. I expected it would simply remind me of my aim to let God’s grace be enough for me. Turns out, it’s both. As I surrender to him, more and more, He pours His grace over me, like streams in the desert. The desert is dry. But when it rains in the desert, oh, how it rains. It never drizzles or sprinkles in the outback. It doesn’t politely shower. It pours. A year’s worth of rain in an hour. Streams flow, where before was a dry and empty riverbed. Dustbowls become lakes. Plants spring up, and flower within days. God keeps His promises. He never leaves us dry for long. As He was with the Israelites in the desert, providing them with manna to eat and water from the rock when they were thirsty, so He will provide for us. He will show us the path through the desert, and be with us, each step of the way. Have you experienced dry spells in your life? Please feel free to share what you learned, and what helped get you through. One commenter will be chosen at random to receive an ebook copy of your choice from my current releases, or my next book, Forget Paris, if you don’t mind waiting a little longer! Very inspiring words today! I had a rough patch after my Mother passed. But the Lord is good & my husband & children & grandkids are a delight so life is Good! Such a timely post. I feel like I’ve been parched for months, but yes, God does send the rain. Sometimes it dries up all too quickly, but knowing that he’s done it before gives me the hope and faith I need to get through until the next storm. My word for the year is peace, and already I’ve learned that I can find amazing peace in those desert places. Thanks for posting this — it was like a spring of water for my soul today! Autumn, lovely post. Thanks for sharing your inspiring and encouraging words with us :) I loved your outback pic and I hope this year becomes easier for you very soon.